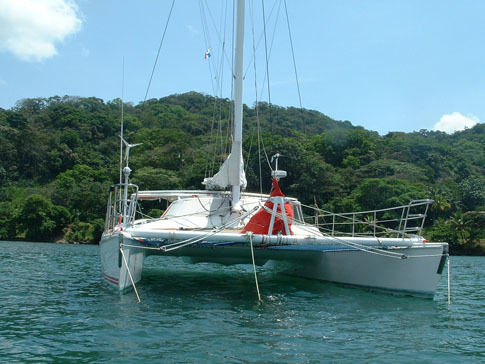 Shearwater, built in 2001, is a beautiful, high performance cruising catamaran featuring a cutting edge design by John Conser. Built by the Endeavor Catamaran Corp, this sleek cruiser is one of nine in the world, is 47 feet long and 24 feet wide and...she is very fast! 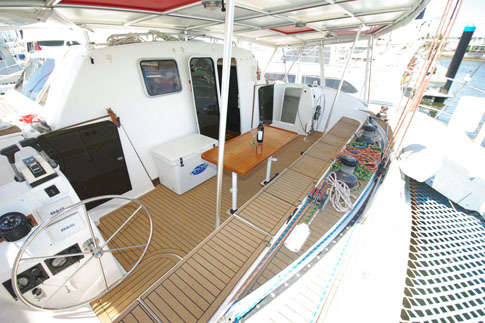 In fact, a sister ship in Hawaii holds the speed record for a production Catamaran - 31 knots! Thank God, I never went that fast! By the way, she is named after a small, rather non-descript bird that is distinguished by having one of the longest migratory routes of any ocean-going bird. Shearwater is very light for her size (12,000lbs dry - 15,000lbs loaded). The so-called "normal" cats are double that!. And because of their rotund and very buoyant hulls they exhibit what is called "hobby-horsing" effect, a rather uncomfortable condition in which the bow and stern push against eachother's buoyancy - up and down, up and down. 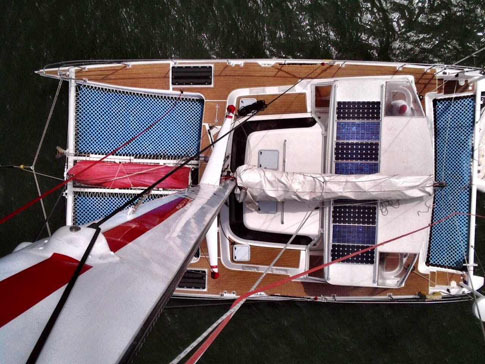 Shearwater was designed with very thin hulls. Her knife-like bows cut through the top of the wave thereby producing a very smooth ride. All this leads to impressive cruising speeds of 12+ knots in 20+ knots of wind, making distances of over 250 miles per day easily achievable. 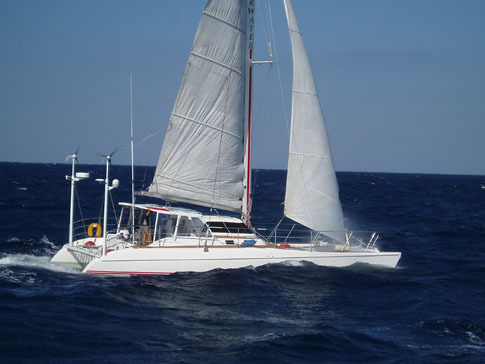 Her highest speed, with me aboard, was a remarkable 22 knots under third reef in the middle of the Pacific. Her construction is very interesting in that its basically a sandwich design-the experts would cringe at that description calling it instead: "high end vinylester resin and triaxial fiberglass knitted cloth and Corecell foam core". What all that means is basically two good sheets of fiberglass with a sort of honey-comb plastic core. This makes it very strong, very light and...unsinkable. One could literally cut this boat into pieces and each piece would float. Perhaps the heart of Shearwater is her huge wing-mast. It looks like an airplane wing and is made from very light carbon fiber. Why a wing mast? When the wind streams over a normal round mast, the mast causes turbulence. This turbulence then takes the first 20% of the sail to "organize" itself, thereby losing a lot of potential power. 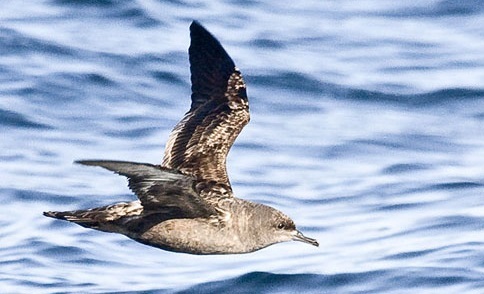 Shearwater's wing-mast is two foot wide, front to back, very smooth and thin. By the time the wind streams across its surface and reaches the sail, it is "organized" with the full power of the sail being used for sailing not "organizing". And...the whole mast rotates such that no matter the direction Shearwater is sailing, it always facing into wind...very neat. But, best of all....the WingMast is gorgeous to look at! 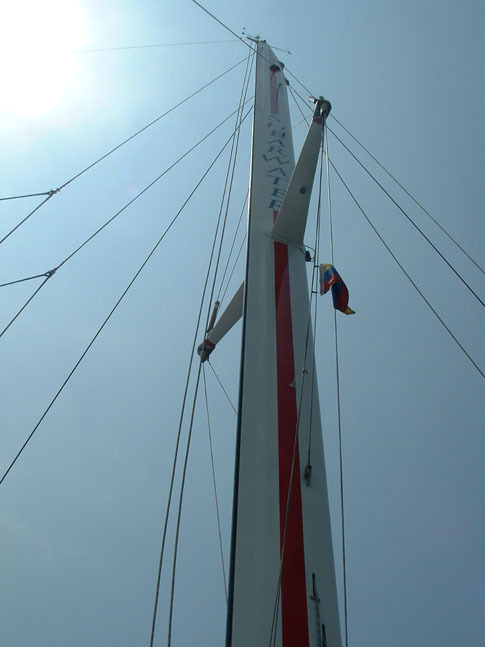 On conventional boats the rigging consists of strong stainless steel rods or woven strands of stainless steel that hold up the mast in a rigid position. On Shearwater, because the massive mast rotates it requires rigging that would allow movement. So, incredibly, the whole mast is held in place by 3 ropes, one on each side and one going forward. These "ropes" are made out of a very strong substance called Spectra which is actually stronger than steel but can be cut by a pair of home scissors. If one of these "ropes" gives way, the whole rig collapses. 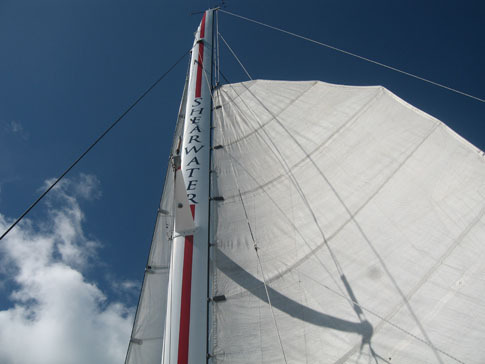 Shearwater is a "sloop" rig meaning one mast and two sails: a main sail and a jib, nice simple rig. She also has a spinnaker. Shearwater is GREEN! I designed her to be almost completely self sufficient...she has 8 solar panels and 2 wind generators that charge two huge batteries. These batteries then power all the various needs of the boat, from watermakers to autopilots to reading lights. 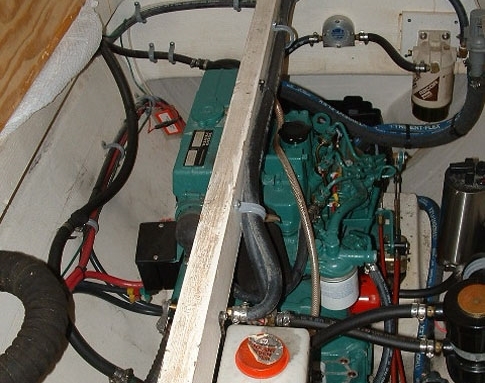 Two 29 horsepower Volvos power Shearwater when necessary...such as in windless condition or coming into harbors. We used less than 250 gallons of diesel in the trip around the world. To put that in perspective, a similar sized motor vessel uses that same amount of fuel in about 20-30 hours!! Shearwater has two steering wheels, one on each side. This is a lovely feature for one can switch from side to side to see what one need to see... ie when docking. She has two rudders, one on each hull, that are controlled entirely by the hydraulic steering. 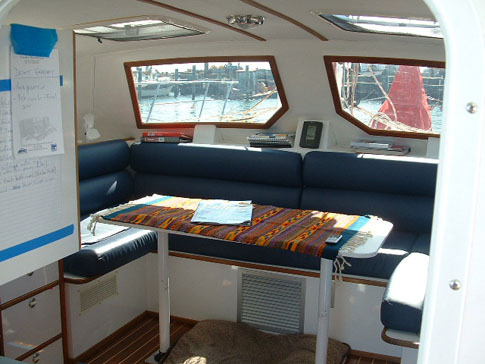 aboard Shearwater consists of a nice galley which is a living room/kitchen/navigation space all in about the space of a small bedroom, but with 360 degree windows. 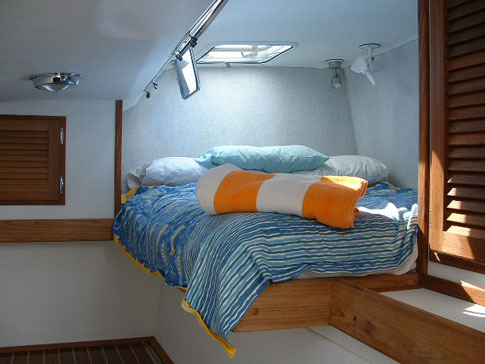 She has two queen-sized berths, one in each hull, each with a full bathroom. A big outdoor cockpit enclosed on three sides joins all the areas...this is where I hung out in my beautiful Colombian Hammock! Much has been written, spoken of, debated about the safety of Shearwater and her massive and powerful rig. And, upon setting out, I too was concerned and didnt really know the answer to many of the questions. But after all these miles and 4 years later, I have to say that she is splendid and emminently controllable. If one is careful, respectful, conservative, Shearwater will be a very obliging craft and, in an ironic twist, a rather safe one at that. Remember, that huge "wingmast"? In the event of losing control of the boat this mast will search the wind and pull up into it and stop. While I never lost control of her per say, she did lose direction a couple of times while I was sleeping and I would awake and find her stopped and into wind...sort of like a nice polite horse standing by its rider, patiently.